Eggplant Parmesan makes a delicious and family favorite meal. 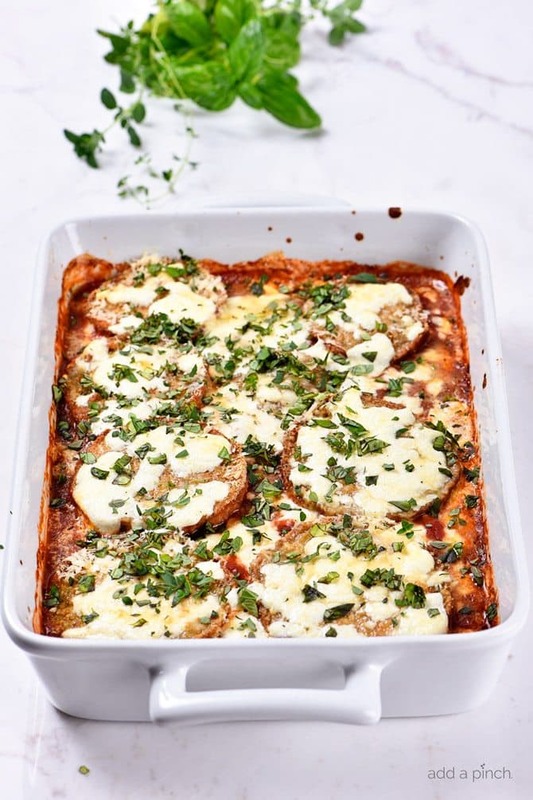 This no-fry eggplant parmesan recipe is layered with baked eggplant, tomato sauce and cheese for a meatless meal the whole family loves! As I was picking vegetables in my garden yesterday, I was trying to decide what I was going to make for supper. I wanted something that I knew my whole family would enjoy. Something easy to prepare, but that tasted like I’d spent time preparing it. Thankfully, my eggplant plants have been producing big, beautiful eggplant lately and I knew just what I’d make! A quick stop by my herb garden and I was all set! Not wanting to deep-fry my eggplant for my eggplant parmesan, a while back I decided to try baking it in the oven instead. It still leaves the eggplant with a crispy, crunchy coating but without the unnecessary fat. I’ve made it the same way ever since! 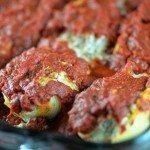 To make my eggplant parmesan there are a few steps to the process, but they are simple and yield a mighty delicious end result that I think you’ll love! I begin by spritzing rimmed baking sheets with olive oil until they are well-coated so the eggplant will not stick while baking. Once my pans are prepared, I then peel the eggplant and then slice it into about 1/2-inch rounds. Mix together the bread crumbs and parmesan cheese in a shallow dish until they are thoroughly blended. You can use plain bread crumbs like I did or Italian bread crumbs, if you prefer. In a separate shallow dish, whisk your eggs and milk together. Dip each slice of eggplant into the egg and then dredge through the bread crumbs until each slice is thoroughly coated on each side. Place the eggplant on the baking sheets in a single layer with a small space space between each slice. After they have baked for about 20 minutes and are golden brown on the bottom, turn them over and bake the other side until they are golden brown and fork-tender, about 20 more minutes. Remove the eggplant from the oven and set it aside. While the eggplant is baking, mix the tomato sauce, kosher salt, and my Italian Seasoning Mix. 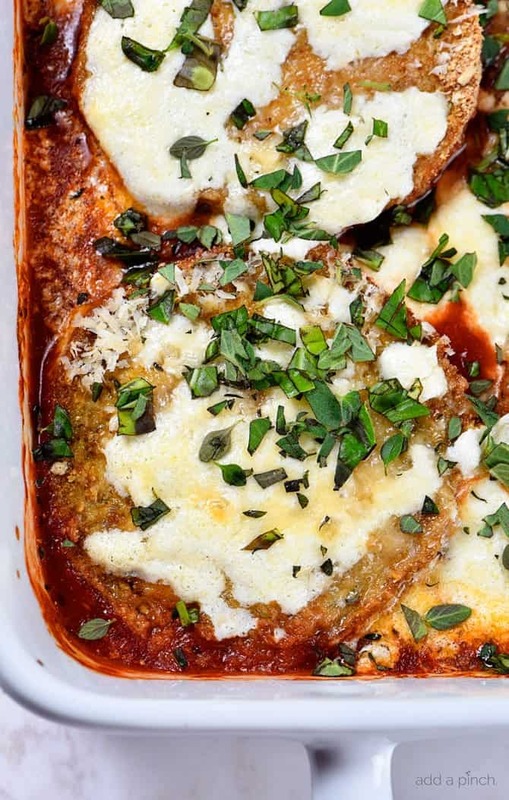 Now, you’ll begin layering your eggplant parmesan in the baking dish. I use a 9×13 baking dish to allow ample room for the casserole to bubble and bake. 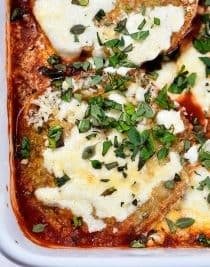 To layer the eggplant parmesan, spread some of the tomato sauce in the bottom of your baking dish and then place half of the baked eggplant on top. Top the eggplant with more tomato sauce and then layer on some mozzarella cheese and sprinkle with Parmesan cheese. 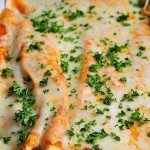 Repeat the layering and bake until the sauce is bubble and the cheese has melted, about 30 minutes. Once the eggplant parmesan has baked, remove from the oven and allow to cool slightly. Then top with chopped fresh herbs like basil, oregano, and thyme to garnish! It just makes the dish even prettier, I think! 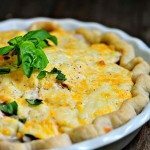 We love the cheesiness of this casserole, but if your family prefers less cheese you can adjust the amounts to your tastes. Here’s my Eggplant Parmesan recipe. I hope your family loves it as much as we do! 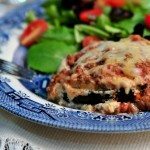 Eggplant Parmesan Recipe - Eggplant Parmesan makes a delicious and family favorite meal. This no-fry eggplant parmesan recipe is layered with baked eggplant, tomato sauce and cheese for a meatless meal the whole family loves! Spray two 9x13-inch rimmed sheet pans with olive oil spray and set aside. Peel eggplant and slice into 1/2-inch rounds. Mix bread crumbs and 1/2 cup parmesan cheese until well-blended. Beat egg and milk until thoroughly mixed. Dip each eggplant slice into egg mixture and then dredge through bread crumb mixture until coated on each side. Place slices in a single layer onto prepared sheet pans. Bake 20 minutes or until golden brown on the bottom; turn over and bake an additional 20 minutes or until fork-tender. Remove from oven and set aside. Mix tomato sauce, Italian Seasoning Mix and salt until thoroughly blended. Spread 1/2 cup of tomato sauce mixture over bottom of 9x13-inch baking dish. Cover with half of the baked eggplant. Spread 1 cup of tomato sauce over eggplant and top with 1 cup mozzarella cheese. Sprinkle 1 cup of parmesan cheese over mozzarella cheese. Repeat layers of remaining eggplant slices, tomato sauce, mozzarella, and parmesan cheese. Bake 30 minutes or until bubbly and cheese has melted. Remove from oven and garnish with chopped fresh basil, oregano, and thyme. Make-Ahead Instructions: Prepare eggplant parmesan without baking. Cover tightly and store in the refrigerator for up to two days. When ready to bake, remove from refrigerator, remove wrap, and bake according to recipe instructions. 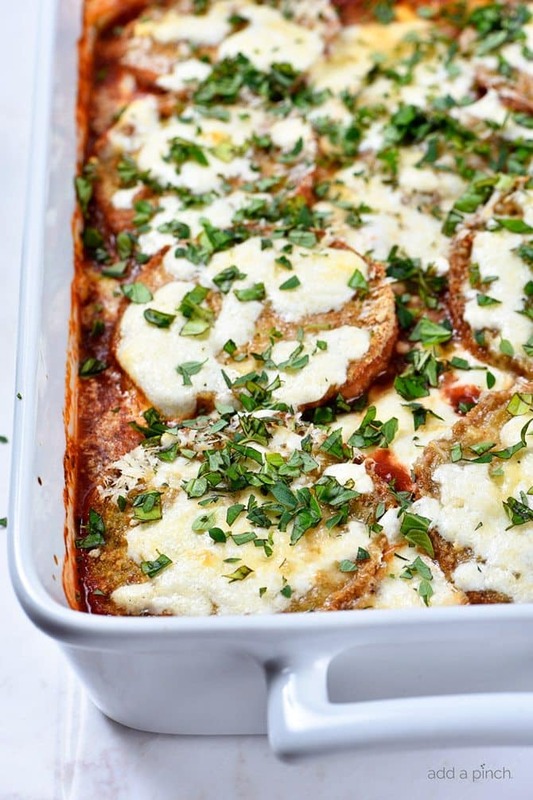 Freezer Instructions: Prepare eggplant parmesan in a freezer-safe baking dish without baking. Cover tightly with plastic wrap, followed by foil. Store in the freezer for up to 3 months. When ready to bake, remove from the freezer and allow to thaw in the refrigerator. Bake according to recipe instructions. I’m trying your recipe this weekend. I love reading your recipes. They are good and easy to make. The food looks great.Do you own a restaurant yourself? This looks delicious and easy to make, it’s kinda like my veggie lasagna I make but with eggplant instead of noodles. I might try it sometime! When I have cooked with eggplant it always has a bitter taste. Have you had any issues with bitterness? The instructions are to sprinkle 1 cup of grated Parmesan cheese on each layer. The ingredients are for only 1 1/2 cups of this cheese. That’s not enough for 1 cup per layer. 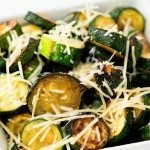 Should the instructions say use 1/2 cup per layer or should the ingredients be for 2 1/2 cups of Parmesan? The recipe sounds wonderful and I plan to make it this week. I do not use the breadcrumbs or egg bath. I simply brush the eggplant slices with olive oil and bake them on a cookie sheet for 20 minutes. Then I put it together with tomato sauce and cheese. You get the true flavorf of the eggplant that way and its low calorie. WE love it this way! Thanks for sharing how you cook your eggplant, Sue! It sounds great! 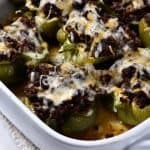 My family likes this recipe as it more closely resembles traditional eggplant parmesan we’ve enjoyed throughout the years. I love eggplant cooked so many different ways! Made it, loved it! It’s a winner recipe – thank you, Robyn! That’s wonderful, Sheryl! I’m so thrilled that you enjoyed it so much – my family loves it too! My mom used to include ricotta cheese in the layering process. We are Italian and that is how she always did it. Try it sometime, it is heavier, but good. So delicious, Brooklyn Girl! I love ricotta so I know your mom’s was so good! Thanks for sharing! Aren’t you supposed to “sweat” the eggplant first? My mom always did that. Salted it and weighted it to squeeze out liquids. I think it removes bitterness. I am usually lazy and in a rush so I always skip it. If we are preparing it ahead of time, do we skip the baking of the eggplant for 20 minutes on each side? If so, do we cook the entire prepared dish for longer, will the eggplant cook all the way through if we don’t cook it prior?